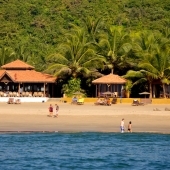 If the city is your natural location, when traveling or on vacation, Palolem beach Goa is your place. All the great advantages and joy of the big city are coming side by side with fresh sea breeze and one of the most picturesque scenes that you will never get to meet in the real city. 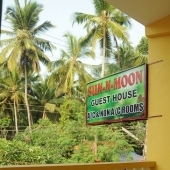 Palolem beach huts are densely situated along the entire stretch of Palolem beach, and the atmosphere in Palolem, is like in a big big very happy family. Even if you don't know someone personally, you will probably recognize his face, and that person will recognize yours. So no matter where you go, whether for a stroll on Palolem beach, or for walk on the main road you will always see smiling faces. To you, to others, to the world. Be careful those smiles are contagious! There is always something happening in Palolem beach Goa. Many things to do, many places to go to. 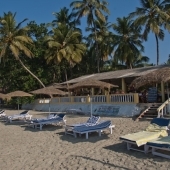 It can be a busy cafe, or a romantic gourmet restaurant, it can be a bar on the beach – a place to drink, dance, and meet other people, or it can be just your Palolem beach huts lounge, or restaurant. There is always somewhere interesting filled with life to be at. And, we mustn't forget one of the most beautiful beaches in Goa. 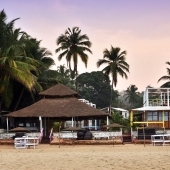 Palolem beach is a beach that dreams are made of. The white sand, the coconut palms, the deep blue see – all packed in half-moon shaped beach, with the most amazing sunsets you can imagine. And of course, also here – you can find any beach and sea activity you can think of – dolphin trips, kayaks rafting, boat trips, and more. Sometimes you just want to go where everybody knows your name, and they're always glad you came.... 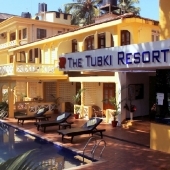 If you choose to stay In a beach resort on Palolem beach Goa, this will happen very fast and you will feel at home in no time.